According to the new visa rule for Bangladesh, it is now possible to get on arrival visa of Bangladesh in the land borders with India beside the airports. Europeans, Americans, Russians, and some Asian country citizens can get the on arrival visa in some selected land borders with India. Although it is little bit tricky and you need to have enough confidence while in the Indian side of the border to let you go, there are few reports from the western travelers who have recently got the on arrival visa for Bangladesh in the land borders. The nationals of those countries where there is no diplomatic mission of Bangladesh may be granted visa on arrival after examining the genuineness of their visit. Only for the purpose of official duty, business, investment and tourism, citizens arriving from USA, Canada, Australia, New Zealand, Russian Federation, China, Japan, Singapore, Malaysia, South Korea, UAE, Saudi Arabia (KSA), Qatar, Kuwait, Oman, Bahrain and the countries of Europe may issue Bangladesh visa on arrival after examining and being satisfied by the immigration authority at the Airports and Land Ports. If any foreign national arrives in Bangladesh from a country other than his/her own country, where there is no mission of Bangladesh may be issued visa on arrival. Bangladeshi origin foreign citizens, their spouses and their offspring may be issued visa on arrival, on the proof of their being Bangladeshi origin. On the basis of invitation letters of interested/required body being attested by the Board of Investment/BEPZA, the foreign investors/businessmen may be allowed to issue visa on arrival. In this case, interested/inviting organization must inform in advance the arrival of the foreign visitor(s) to the immigration and passport authority. The staffs/officials of the foreign missions, UN or its affiliated organizations located in Bangladesh may be issued visa on arrival after examining their appointment letters or other related documents. Only UN passport holders will get such facilities gratis (free of charge). Bangladesh has many land borders with India, but it will not be possible to get on arrival visa in every border. Immigration offices require to have some facilities to issue on arrival visa for Bangladesh which are not available in every border right now. You can get Bangladesh visa on arrival in the Benapole / Petrapole border only, which is close to Kolkata. I recently did this – went in November by bus from Kolkata to the Bangladesh border, got a visa on arrival, carried on all the way to Dhaka by local buses, one hop at a time.. getting the VOA was no problem, the Bangla officials were kind and helpful, I didn’t have to show anything other than my passport, but it did cost $50 and another $8 tax when I came back the same way. I have India multiple entry visa so no issue with Indian immigration either. I went by the biggest land crossing at Benapole/Petrapol.. got the Greenline bus to there at 6am from very near Sudder St in Kolkata.. initially I tried to get a visa from Bangla consulate in Kolkata and they had refused saying just get a VOA at Dhaka airport – they were very busy and didn’t want to answer any questions regarding land crossing, I didn’t want to fly so I just went by bus and it worked fine. Firstly: it is possible for citizens of certain countries (definitely the EU, where we’re from, check the official websites for the full list) to get a 30 day visa on arrival at certain land borders of Bangladesh. This does not include the border crossing the Maitree Express, the direct train from Dhaka to Calcutta, uses. We found out the hard way when we were kicked off the train at the Indian side of the border and sent to a different crossing, at Petrapole-Benapole. If you are travelling overland from Calcutta getting the visa on arrival seems to be the only option, since the Bangladeshi High Commission in Calcutta would not even let us in the door, as we were Europeans and thus did not need a visa. They also told us we would definitely be able to get a VoA where the train crosses, though, so double-check all information they give you. At Petrapole-Benapole, we had to be very firm with the Indian customs agents, who were convinced that it was impossible for us to get the VoA just a few hundred meters down the road, and did not want to let us leave the country. Eventually they called their Bangladeshi counterparts and asked, and then let us through. We convinced them mostly because we had a multiple entry visa for India, and so would always be able to come back. If you have a single entry visa they may cause you more trouble. If you already have a visa the Maitree Express is probably a more comfortable way to get across the border. Tickets are not sold online, but you have to go to the office on Fairlie Place in Calcutta, and enter on the left side rather than the right where most of the other tourists will be (again, we got this wrong initially and queued for an extra hour). We managed to get a ticket one day before departure, 2nd class but still with quite comfortable tour bus-type seats. 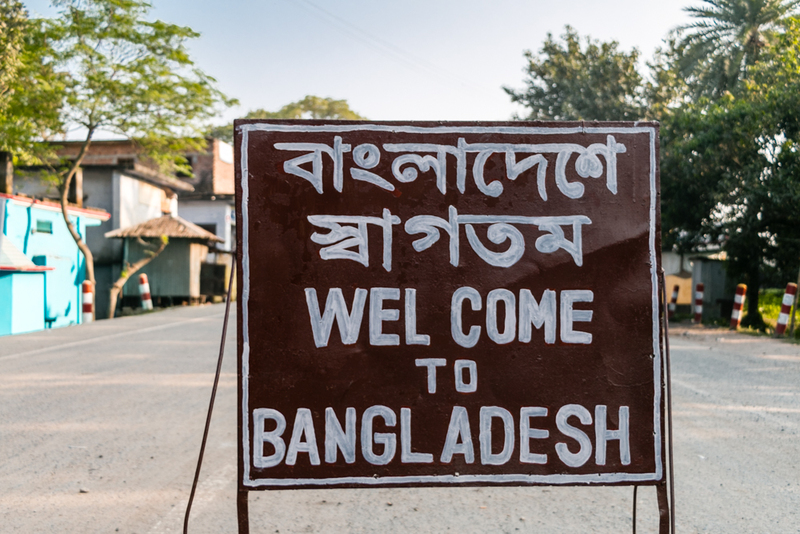 Have you ever got Bangladesh overland visa on arrival in the Indian border? How was your experience? Share with us in comments.